﻿ 5 Retro Floor Lamps To Make Your Home As Glamourous As You! The Proof That Glamour and Taste Go Hand in Hand. The best of the best is always yet to come. With these 5 retro floor lamps, your home interior decor will be the best one you’ve ever seen yet. Take a peek at what we have to offer you and let your design muse be inspired! YOU MIGHT ALSO LIKE: BE DAZZLED BY THIS MID-CENTURY MODERN RESIDENCE! Hanna | A retro floor lamps that will suit perfectly in your mid-century modern living room or vintage retro design hallway. Bathed in gold plated and matte white finishes, Hanna showcases a high-quality craftsmanship, since it was applied an ancient technique called hand metal spinning. On the whole, this brass floor lamp reports to a classical ambience, back to art deco, evoking a powerful mid-century modern design. Amy | The incredible diva of modern jazz was the one that brings this outstanding modern floor lamp alive. Amy Winehouse, with it’s outstanding and dazzling features bring the vintage retro style that embodies the soul of the British artist and the 50’s interior design style. With a glossy black lamp shade that bears a resemblance to Amy’s legendary hair and a small gold powder paint detail that recall us of her golden earring, the brass floor light suits the most demanding mid-century modern setting. 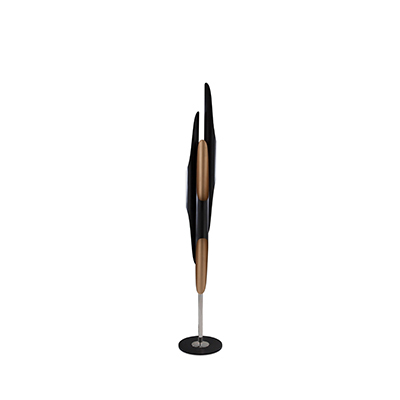 Neil | This retro floor lamp brings a futuristic look to your retro modern decor. With a strong presence of space in it, the mid-century modern floor lamp brings out the unique taste that only you can bring into your home decor. Simone | With an outstanding way of bringing glam to your living room layout, this retro floor lamp was inspired by the one and only Nina Simone. This unique lamp is a strong statement piece, that cannot go unnoticed wherever it’s placed. With textile red wires above the large lamp shades, this retro light will create the perfect atmosphere for your mid-century modern home. All in all, Simone standing lamp aims to pass on Simone’s powerful personality, as well as her bold and warrior features. Cole | A retro-inspired floor lamp that has a three-shade design with a glossy black exterior and a matte white interior finishing. 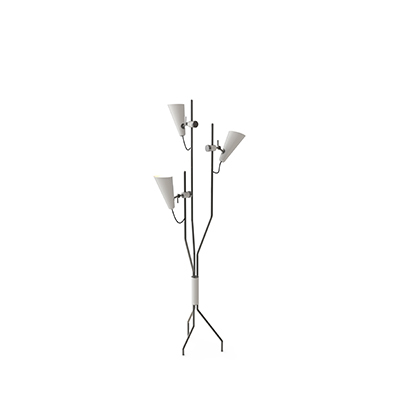 With three asymmetrical arms, Cole floor light has a balanced elegance and presence that won’t go unnoticed. This mid-century modern lamp provides brilliant light for any vintage industrial office or living space. YOU MIGHT ALSO LIKE: PANTONE COLOUR OF THE YEAR AND HOME INTERIOR TRENDS! 5 Iconic Movies To Inspire Your Home Decor!